Thank you for your interest in youth sailing at Silver Gate Yacht Club. 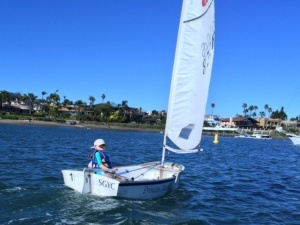 We offer a unique learn to sail and recreational youth sailing experience from our club facilities on Shelter Island in San Diego. 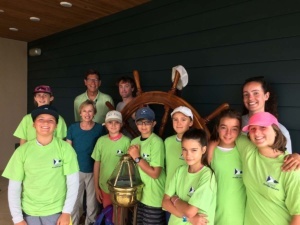 Our dedicated staff and volunteers have developed a program designed to teach solid sailing fundamentals, instill Corinthian spirit and respect the marine environment – all while having fun on the water! Our goal is to provide a sailing experience that keeps kids coming back for more and instills a love of sailing that will stay with them for a lifetime! Junior Sailing at Silver Gate is open to all kids from 8 to 18 and you need not be a club member to participate. We limit our weekly groups to about 14 sailors. Sign up now! Membership at SGYC is not required. Open to all kids who want to sail! Very low student to instructor ratio – usually about 4 or 5 kids per instructor. This is lower than we typically see in similar programs locally and across the country. We supply the boats at no extra cost. 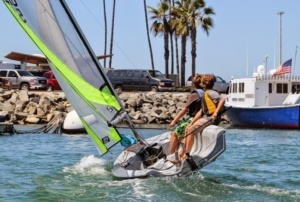 Many youth sailing programs require that you bring your own boat or charter a boat from them. Full day sessions. Our summer program operates with full-day sessions from 8:30AM to 4:00PM. Most other area programs are half day sessions. We find that the full day sessions allow us to engage the kids more deeply with the complexities of learning to sail. And, parents seem to like the convenience of a full day session. Exciting boats. Our fleet of boats includes some of the newest designs in the industry. The single handed O’Pen Bic is tremendously popular with the kids. It has a self-bailing cockpit, built-in floatation, is very easily righted and is super responsive. The RS Feva is new to our fleet this year and provides a great move up option for kids that are outgrowing the Bic or want to move on to double-handed sailing with a crew. This boat has similar characteristics to the Bic but in a sloop rig and with the option to use the asymmetrical spinnaker. We also have the Naples Sabot – the traditional Southern California learn to sail pram as well as the Laser and Club Flying Junior (CFJ). Our Hunter 216 is a sloop-rigged keel boat with modern sport boat styling. This boat allows us to offer a ‘big boat’ experience to young sailors at any skill level. Small groups. We limit our weekly groups to about 14 sailors. This ensures we can provide excellent training and supervision which tends to increase safety as well. Learning to sail a small boat at a young age has been shown to enhance self-esteem and confidence in kids. There is tremendous satisfaction, pride and empowerment that come with learning to sail a small boat on your own. Parents tell us that these positive attributes can play out in their child’s school work and in social settings as well. Safety is paramount in our program. All of our instructors are certified in first aid, CPR and hold a minimum Level 1 teaching certificate from US Sailing. We require that kids participating in our program are confident swimmers. First time participants are given an in-the-water swim check on their first day of the program. Kids are required to wear PFD’s any time they are on the docks or in the boats. When kids are out in the boats they are supervised by our instructors in our fleet of Boston Whaler power boats. For kids that want to try test their skills on the race course we offer some opportunities to do that in a casual or more formalized setting. Sometimes just having kids participate in a quick, informal race gives them opportunities to learn – and they don’t realize it’s happening! We also participate every year in the always popular Dutch Shoe Marathon. This is a race in sabots from the Shelter Island yacht basin, out into the bay, and south to a finish near the Coronado Yacht Club – over 7 miles. It’s a significant achievement just to finish the race! Our program operates year-round. In the summer we offer 7 weeks of week-long, full-day sailing sessions. In the fall, winter and spring seasons we provide weekend sailing opportunities for the kids to refine their skills or just kick back on a boat with friends. 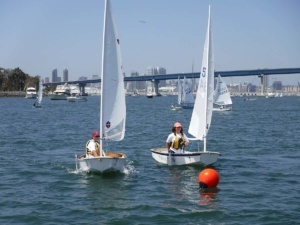 The Silver Gate junior sailing program operates under the Silver Gate Yacht Club Foundation with 501c3 tax status. We are largely a volunteer run organization and would appreciate your donations or volunteer support. Please visit our Support / Donations page for more information.